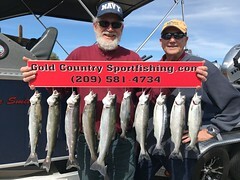 Returning Client John Kern was onboard with me on March the 8th at Don Pedro fishing alone. This day was a great day of fishing. Almost everywhere we fished we caught fish and they were very nice fish. We were fighting a reservoir with falling water levels and this can make for tough fishing. 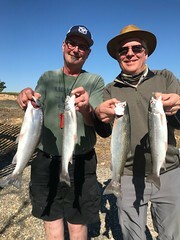 We caught some of the nicest fish I’ve caught at Don Pedro in years. John does not keep fish, we were lucky enough to release all the fish unharmed. 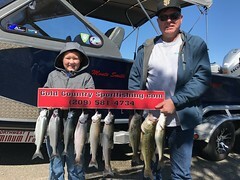 By the end of the day john landed 12 rainbows with the largest fish measured 22 inches, we didn’t weigh it we wanted to get the fish back in the water. There are a couple photos that I was able to get. Thanks again John.